I also had a $25 from working with General Mills and Platefull Co-Op, so I didn't spend a dime out of pocket this week. We will probably spend about $10 at the local produce stand but that still gives us plenty of extra grocery cash to save towards our upcoming Spring Break trip to Disney. 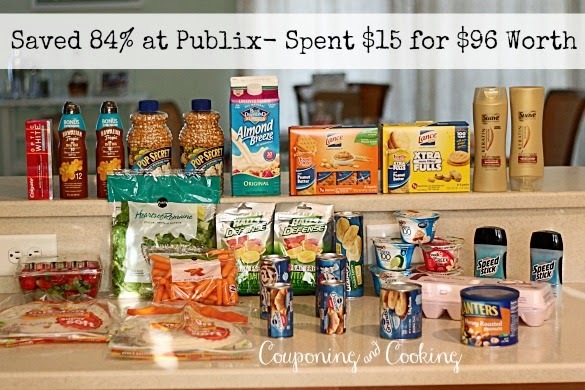 Look for coupons and details in the Publix® weekly ad, 3/12/14 – 3/19/14 (in-store start dates may vary in certain markets). Coupons valid 3/12 – 3/26. I am loving the coupon for $3 off fruit when you buy Quaker Oatmeal and the one for $2 off meat when you buy Lays Kettle Chips. What coupons are you most excited about?